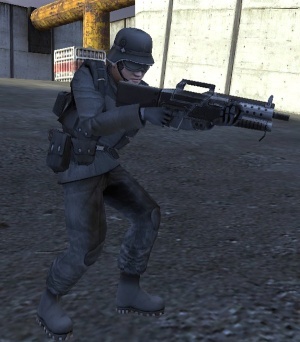 Difference between revisions of "Rifleman"
Riflemen are the undisputed masters of infantry combat. They can use the most powerful rifles and machine guns, wielding them with an ease no others can match. In addition, these troopers spawn with either explosive grenades or sticky bombs and a suit of body armor, making them a force to be reckoned with on the battlefield. The Rifleman's skills are focused on what he does best: infantry to infantry combat. Two offensive skills increase the damage dealt by his weapons, and one defensive skill decreases damage dealt to him. Damage Increase and Vehicle Damage increase damage dealt with hand and vehicle weapons, respectively. The Dig In skill increases the Rifflemen's blast damage resistance while crouched, by applying half the damage to their stamina instead. The Rifleman's skills are focused on what he does best: infantry to infantry combat. Two offensive skills increase the damage dealt by his weapons, and one defensive skill decreases damage dealt to him. Damage Increase and Vehicle Damage increase damage dealt with hand and vehicle weapons, respectively. The Dig In skill increases the Riflemen's blast damage resistance while crouched, by applying half the damage to their stamina instead. 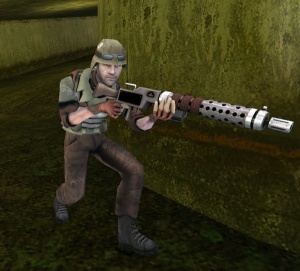 Riflemen have access to a very powerful anti-vehicular weapon, the sticky bomb. Due to its weight a Rifleman can only carry two of them (four with the Ammo Upgrade skill), and it cannot be thrown quite as far as a plain grenade. However, its ability to stick to the target vehicle and its payload more than makes up for the danger of having to get up close to the enemy tanks. * The firing accuracy will be much better while crouched, and even better still when prone with certain weapons like the Heavy Machine Gun. * Bringing up the iron sights (default: right click) gives an accuracy bonus of another 25%, but cuts the moving speed in half in standing and crouching positions. Moving in iron sights mode while prone removes iron sights. * If not using the Heavy Machine Gun, the Ammo Upgrade skill is crucial, especially when there are no Engineers nearby for resupplying. * Explosive grenades are very effective against infantry, turrets, and even heavy tanks (tanks will shake when hit). The trick is getting close enough to use them without getting killed. * The sticky bomb is extremely effective against enemy vehicles. A single bomb deals 300 points of damage and is often able to kill a heavily armored tank. The only down side is that you must get within a meter or two of the enemy vehicle in order to score a hit. Bear in mind that it deals only 150 damage to the heavy armor of the CV. * The sticky bomb is extremely effective against enemy vehicles. A single bomb deals 300 points of damage and is often able to kill a heavily armored tank. The only down side is that you must get within a meter or two of the enemy vehicle in order to score a hit. Bear in mind that it deals only 150 damage to the heavy armor of the Command Vehicle, and to buildings. * The secondary fire button on rifles (except the Heavy Machine Guns) allows you to access your Ironsights. While it may be more difficult to see much of the battlefield, the added zoom and accuracy can prove valuable in the right situations. * Firing the Heavy Machine Gun drains your stamina at a fast rate. * If using the Heavy Machine Gun and in the presence of a friendly ammo crate, it is effective to use your weapon to spray places where enemies are likely to come out of cover, restricting enemy movements, and perhaps generating a few easy kills. * ''Plan Your Sidearms:'' As a rifleman on Northern Faction, you have the option of using the Double Barrel pistol, a powerful handgun that can kill instantly if aimed well, and at the right range. This weapon's usefulness depends greatly on your primary weapon. If you use the Heavy Rifle or Heavy Machine Gun, and don't stand a chance against an enemy in close range it would be optimal to use this pistol for close encounters. If using the standard Assault Rifle, the 9mm may be a better choice for medium range encounters. As a rifleman on Brenodi Empire, the Machine Pistol serves much the same purpose as the Double Barrel Pistol, and excels in close encounters. If you chose the standard Assault Rifle and aren't confident about your close range accuracy, it would be best to choose the Machine Pistol. If you are using the Heavy Machine Gun, you should use the Machine Pistol to be able to kill in close range. * ''First Upgrade:'' '''Accuracy''': Rarely will you ever choose anything but accuracy as a Rifleman. Getting more bullets to hit your target will maximize your damage over time; even more efficiently than the Improved Damage upgrade. It will also increase your effective range, which is essential on large maps. * ''Plan Your Skills:'' Riflemen, like all the other classes, have quite a bit of versatility and can be made far more effective if you choose your skills wisely. If you're on a wide-open map, accuracy is a good starter skill. If you're on a map with a lot of tanks or you know you'll be running into some, Ammo Upgrade is essential when using sticky bombs. If you're on a small map where accuracy might not come into play as much, consider choosing a good defensive skill, like Health Upgrade. * ''Essential Skills:'' '''Improved Damage''': This skill means that you can drop your targets faster, which gives them less chance to hurt you. '''Health Upgrade''': Front-line infantry cannot avoid taking damage: this upgrade will help you to live longer, and give you the necessary edge in some fights. '''Dig-In''': Effectively converting your extra stamina into health, combine this with Health Upgrade and you become your squad's human tank. * ''Essential Skills:'' '''Accuracy''': Rarely will you ever choose not to get accuracy as a Rifleman. Getting more bullets to hit your target will maximize your damage over time; even more efficiently than the Improved Damage upgrade. It will also increase your effective range, which is essential on large maps. '''Improved Damage''': While not as useful as Accuracy, this skill means that you can drop your targets faster, which gives them less chance to hurt you. '''Health Upgrade''': Front-line infantry cannot avoid taking damage: this upgrade will help you to live longer, and give you the necessary edge in some fights. '''Dig-In''': Effectively converting your extra stamina into health, combine this with Health Upgrade and you become your squad's human tank. '''Ammo Upgrade''': This skill is only marginally useful unless using Sticky Explosive Grenades. When using Sticky Nades, this skill is ''incredibly'' useful. If you know you're going to run into tanks, grab this upgrade. * ''Heavy Machine Gun Skills:'' The Heavy Machine Gun operates by draining your stamina bar. This means that the useful skills for it vary from the usual rifleman skills - you'll have to conserve your stamina in every situation, which means '''Stamina Upgrade''' is essential, and the '''Speed Upgrade''' is nice to compensate for the lack of sprinting ability. * ''Heavy Machine Gun Skills:'' The Heavy Machine Gun operates by draining your stamina bar. This means that the useful skills for it vary from the usual rifleman skills - you'll have to conserve your stamina in every situation, which means '''Stamina Upgrade''' is essential, and the '''Speed Upgrade''' is nice to compensate for the lack of sprinting ability. After these two, standard rifleman choices apply. The firing accuracy will be much better while crouched, and even better still when prone with certain weapons like the Heavy Machine Gun. If not using the Heavy Machine Gun, the Ammo Upgrade skill is crucial, especially when there are no Engineers nearby for resupplying. Explosive grenades are very effective against infantry, turrets, and even heavy tanks (tanks will shake when hit). The trick is getting close enough to use them without getting killed. The sticky bomb is extremely effective against enemy vehicles. A single bomb deals 300 points of damage and is often able to kill a heavily armored tank. The only down side is that you must get within a meter or two of the enemy vehicle in order to score a hit. Bear in mind that it deals only 150 damage to the heavy armor of the Command Vehicle, and to buildings. The secondary fire button on rifles (except the Heavy Machine Guns) allows you to access your Ironsights. While it may be more difficult to see much of the battlefield, the added zoom and accuracy can prove valuable in the right situations. Firing the Heavy Machine Gun drains your stamina at a fast rate. If using the Heavy Machine Gun and in the presence of a friendly ammo crate, it is effective to use your weapon to spray places where enemies are likely to come out of cover, restricting enemy movements, and perhaps generating a few easy kills. Plan Your Sidearms: As a rifleman on Northern Faction, you have the option of using the Double Barrel pistol, a powerful handgun that can kill instantly if aimed well, and at the right range. This weapon's usefulness depends greatly on your primary weapon. If you use the Heavy Rifle or Heavy Machine Gun, and don't stand a chance against an enemy in close range it would be optimal to use this pistol for close encounters. If using the standard Assault Rifle, the 9mm may be a better choice for medium range encounters. As a rifleman on Brenodi Empire, the Machine Pistol serves much the same purpose as the Double Barrel Pistol, and excels in close encounters. If you chose the standard Assault Rifle and aren't confident about your close range accuracy, it would be best to choose the Machine Pistol. If you are using the Heavy Machine Gun, you should use the Machine Pistol to be able to kill in close range. Plan Your Skills: Riflemen, like all the other classes, have quite a bit of versatility and can be made far more effective if you choose your skills wisely. If you're on a wide-open map, accuracy is a good starter skill. If you're on a map with a lot of tanks or you know you'll be running into some, Ammo Upgrade is essential when using sticky bombs. If you're on a small map where accuracy might not come into play as much, consider choosing a good defensive skill, like Health Upgrade. Essential Skills: Accuracy: Rarely will you ever choose not to get accuracy as a Rifleman. Getting more bullets to hit your target will maximize your damage over time; even more efficiently than the Improved Damage upgrade. It will also increase your effective range, which is essential on large maps. Improved Damage: While not as useful as Accuracy, this skill means that you can drop your targets faster, which gives them less chance to hurt you. Health Upgrade: Front-line infantry cannot avoid taking damage: this upgrade will help you to live longer, and give you the necessary edge in some fights. Dig-In: Effectively converting your extra stamina into health, combine this with Health Upgrade and you become your squad's human tank. Ammo Upgrade: This skill is only marginally useful unless using Sticky Explosive Grenades. When using Sticky Nades, this skill is incredibly useful. If you know you're going to run into tanks, grab this upgrade. Heavy Machine Gun Skills: The Heavy Machine Gun operates by draining your stamina bar. This means that the useful skills for it vary from the usual rifleman skills - you'll have to conserve your stamina in every situation, which means Stamina Upgrade is essential, and the Speed Upgrade is nice to compensate for the lack of sprinting ability. After these two, standard rifleman choices apply. This page was last modified on 19 July 2016, at 00:29.